In an LTE cellular network an LTE base station (eNodeB) traditionally uses three sectors and three antennas. 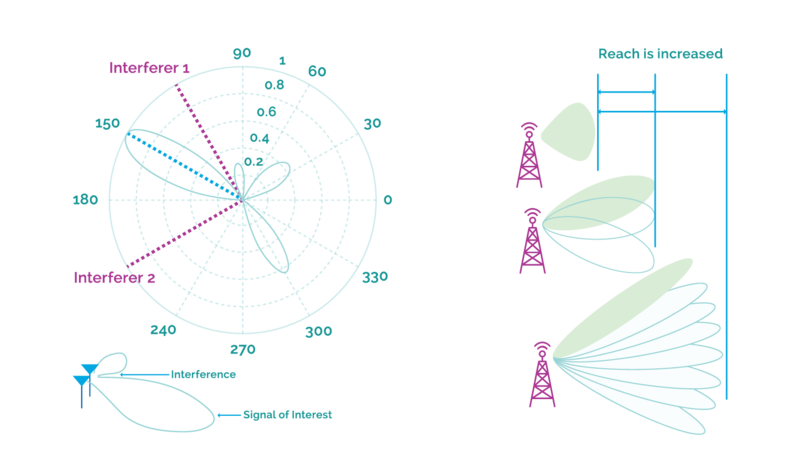 An azimuth plane coverage angle of 120 degrees provides sector coverage in the azimuth plane using the main antenna lobe. An elevation plane coverage angle provides coverage in the elevation plane. The z-axis side lobes are also used for this purpose. A mechanical tilt is used to point antennas downwards to provide better coverage in terrestrial environments. Only the main antenna lobe is depicted in this figure. Horizontal radiation pattern for 3-sector antenna. In addition to antenna sectorization, LTE supports beamforming, a technique whereby the antenna beam is concentrated in a specific direction to improve the link budget and thus the connection to a given terminal (or to multiple terminals simultaneously) using space separation. It should be noted that beamforming works in both the transmit or receive paths. Beamforming can be used to focus the antenna in the direction of interest and create a null in the direction of an interferer / Beamforming can be used to focus the antenna pattern in a given direction and thus increase the reach by separating users in space. More recently, full dimension MIMO, introduced in 3GPP LTE Release 13 and improved in Release 142 3, allows generalized beamforming in the vertical axis. However, the main direction of the eNodeB antenna beam is towards the ground since LTE was originally designed to serve ground-based terminals. 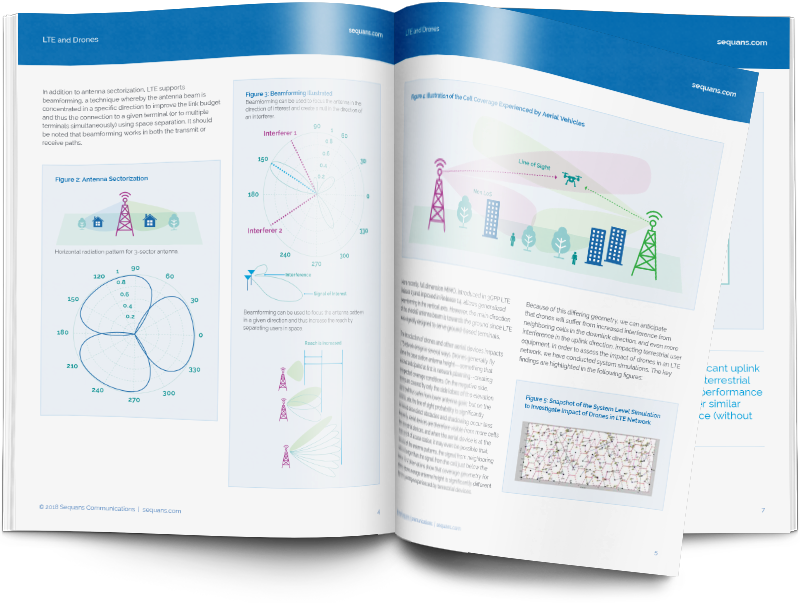 The introduction of drones and other aerial devices impacts LTE network design in several ways. Drones generally fly above the base station antenna height—something that was not anticipated at first in network planning–creating unexpected coverage conditions. On the negative side, drones are covered by only the side lobes of the elevation plane and thus suffer from lower antenna gain; but on the positive side, the line of sight probability is significantly increased since direct obstacles and shadowing occur less frequently. Aerial devices are therefore visible from more cells than terrestrial devices, and when the aerial device is at the exact zenith of a base station, it may even be possible that, because of the antenna patterns, the signal from neighboring cells is stronger than the signal from the cell just below the device. First observations show that coverage geometry for objects above average antenna height is significantly different than the coverage experienced by terrestrial devices. Figures 6 and 7 show the Cumulated Density Function (CDF) of the signal to interference and noise ratio (SINR) for aerial and terrestrial devices for various penetration rates of aerial devices. In the downlink, drones are more easily reachable from inter-cell signals and this has an average impact of -9dB on the downlink SINR compared to the downlink SINR of the terrestrial UEs with no drone presence. The downlink SINR of the terrestrial devices is not affected by the presence of drones. However, because of the degraded performance of drone UEs, the network will suffer from an overall degradation of capacity, since more resources must be allocated to drones to compensate for their lower SINR. 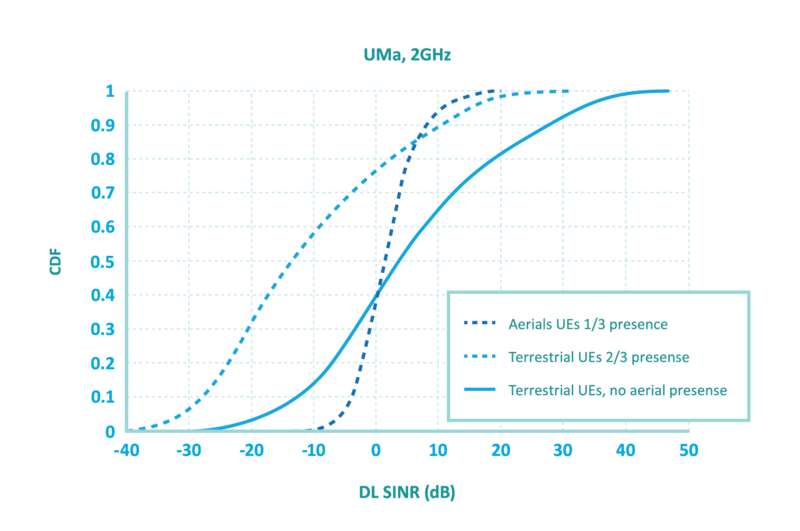 As a result, the downlink performance of terrestrial UEs is also affected by the presence of aerials. Shown without (solid line) and with (dashed lines) the presence of drones. Shown without (solid line) and with (dashed lines) the presence of aerials. 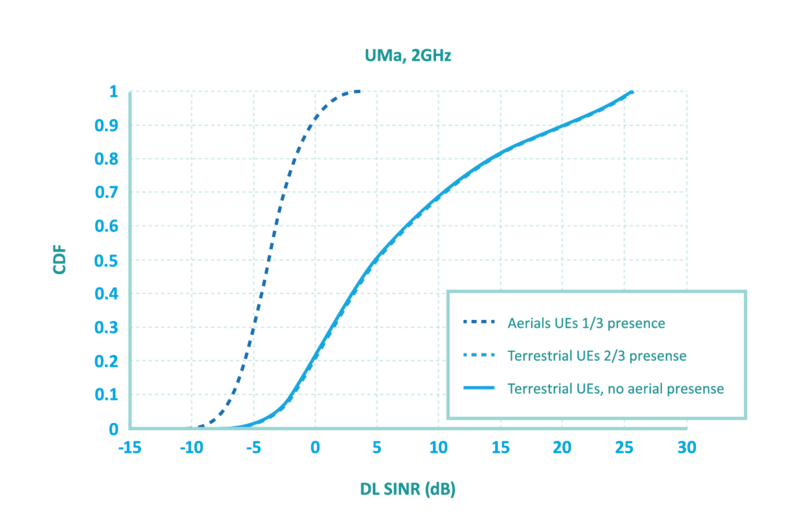 In the uplink, drones have a more dominant inter-user presence than terrestrial UEs and this has an average impact of -16dB on uplink SINR degradation for terrestrial UEs, compared to the uplink SINR performance of terrestrial UEs when aerials are not present. The uplink average SINR degradation of aerials compared to terrestrial UEs without aerial presence is not as significant. It should be noted that these results were obtained without power control. These simulation results show that the presence of drones inside an LTE network not only results in degraded downlink connectivity for aerial devices, but also has a significant negative impact on the uplink connection of terrestrial devices.